Is the Greek alphabet all Greek to you? If so, you need The Greek Alphabet: 24 Letters in 24 Hours – a guide to modern Greek script for English speakers, designed and formatted for the Kindle. The book offers a quick guide to Greek letters for the beginner – followed by a detailed, letter-by-letter guide to modern Greek pronunciation and transliteration. There are also useful exercises, and plenty of examples of words in Greek script. With the help of this book, you’ll be able to read the Greek letters you see in Greece and Cyprus – from shop fronts to road signs, menus to maps, bottles of wine to ancient mosaics – giving you more confidence in the Greek language everywhere you go. Greek isn’t as hard to read as it looks, so buy The Greek Alphabet: 24 Letters in 24 Hours – and give it a go. When people go on holiday to Greece or Cyprus, they often learn a few phrases for themselves before they go. They learn the words for please, thank you, hello and goodbye, and how to order a beer. But instead of learning them in Greek letters, they sometimes learn what I call “Greek in English”: in other words, they commit to memory English spellings such as parakalo, efharisto, yassou, mia beera, and so on. 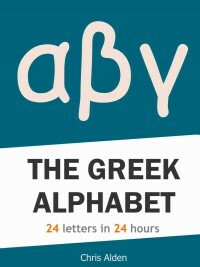 Personally I think that’s a mistake, which is why I set out to write The Greek Alphabet: 24 Letters in 24 Hours – a quick guide to the Greek alphabet in ebook form. The problem is that the Greek alphabet and the English alphabet don’t map precisely to one another; so if you learn Greek in English letters, you are only ever approximating the sounds. Worst of all, as I recently wrote in a guest article for Omniglot.com, there is more than one way to spell any given Greek word in English – and you will often find even place names spelled in many different ways. In that article I outline some of the fun and games you can have with Greek-to-English transliteration. Basically there are three main schemes of writing Greek in English, with variations on each. Read the article if you want to know more – but the upshot is that you can book a holiday in a place called “Hania” and when you get there, find the word “Chania” written on all the signs; or start calling a man “Georgios” when “Yoryos” is how it’s pronounced. English spellings even go in and out of fashion. 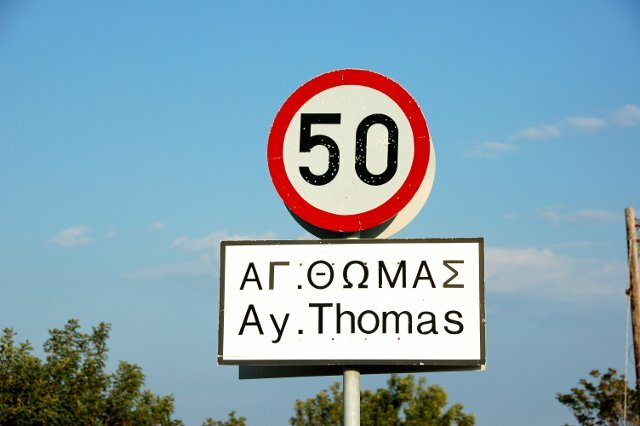 In the Cypriot example below, the current official English transliteration for the name of the village is “Agios Thomas”, but this older sign says “Ay. Thomas”, which is an abbreviation of “Ayios Thomas” (a closer pronunciation match) – which may or may not be written on your map. Nothing in the English spelling, though, will prepare you for the fact that the “th” should be pronounced like the “th” in “thesis” – unless of course you have learned your Greek letters. Personally I think the sounds of Greek are all-important, which is why, when writing this book, I’ve tried to make pronunciation my guide as far as I can. In the book, I’ve devoted a new page to each letter – so I can explain how each letter of the alphabet is pronounced, with reference to English – and if any letter is particularly tricky (I’m thinking of you, gamma) I can explain it in full, warning against any common mistakes. Best of all, the really easy thing with Greek is that if you know how a letter is pronounced, you really know it: there are no English nasties like “enough”, “cough”, “though”, “thought” and “bough”. The end result, I hope, will be a book that gives you confidence pronouncing the Greek alphabet and reading Greek letters; so that when you’re driving down the motorway in Greece or Cyprus, you won’t be confused by the many possible English spellings – because you’re the one reading the Greek. Is the Greek alphabet all Greek to you? It needn’t be, thanks to the new Kindle ebook from Islebright Books & eBooks. The Greek Alphabet: 24 Letters in 24 Hours is a quick, accessible guide to the modern Greek alphabet, to take with you on your travels – so you can start reading signs, menus, wine bottles and more in the original Greek. The book opens with a handy overview to all the Greek letters – before moving on to a page-by-page guide to the pronunciation of each letter in turn. Armed with this book, you’ll have the power to read out loud a great deal of written Greek, including place names, restaurant names, and more – which is far better than relying on misleading and notoriously variable English transliterations. And it needn’t take long – so why not try learning the Greek alphabet today?